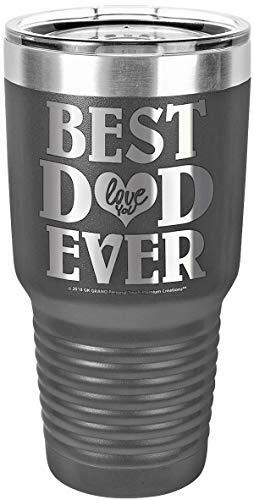 SEE OUR OTHER GREAT GIFT IDEAS ~ ENGRAVED TUMBLERS, PICTURE FRAMES, CUTTING BOARDS AND MORE: for Dad, Mom, Family, Friends, Grandma, GiGi, Nana, Grammy, Nonna, MiMi, Grandpa, Pop-Pop, Poppy, Papa, Pops, Coach, Best Hunting Dad Ever, Best Mom Ever, Mommy Sippy Cup, Stemless Wine Glass Tumblers, Housewarming, Graduation, Christmas, Birthday, Valentine's Day, Travel Mugs & many more! Click above on (GK GRAND) or (GK Grand Personal-Touch Premium Products) to see our many great gift ideas! STYLISH DESIGN 18/8 STAINLESS STEEL TUMBLER: Our unique engraved tumblers are double wall vacuum insulated and have tremendous temperature retention that keeps your beverage COLD for up to 24 hours and HOT for up to 8 hours. Air sealed between 2 layers provide maximum insulation to maintain beverage temperature. It's the best option to keep your coffee, ice tea or your favorite beverage fresher and longer than ever. Makes this the most durable travel coffee mug you will ever have. LOOKING FOR YOUR OTHER UNIQUE NAMES: MiMi, GiGi, Nana, Mom, Pops, Papa, Dad, Coach, Teacher, Sister, Brother, Mother, Grandma, Grammy, Nonna, Soccer Mom, Hockey Mom, Best Huntin' Fishin' Lovin' Dad Ever, Mommys Sippy Cup, Mommys Wine Down Starts Now or Mommys Happy Hour Starts Now and many more just Click above on (GK Grand Personal-Touch Premium Products) to go to GK Grand Store to view availability of other Unique Names and variety of colors.